Katitude does Poker: It's 4 am. Do you know where your car is? 1 Comments Published by katitude on Sunday, September 07, 2008 at 9:11 a.m..
Last night was a night of watching my favourite cult movies. Repo Man, Bruce MacDonald's Road Kill (with a cameo by Joey Ramone), Rock n Roll High School, and Heathers. This morning I am groggy after disturbing dreams of dead aliens, rabbits, Vince Van Patton and Christian Slater. I've never been so glad to wake up. I played some poker last night, of the cheap and cheerful variety. As I watched bad movies, I knocked out enough people in a $3+.30 KO MTT to make back my money. The highlight was going all in with the hammer and having the biggest tard at the table call me with AA. The board came 227,2,7. The fireworks were so pretty. Oh, and guess what??? I CASHED in the Donkament!! I KNOW! Weird, eh? I think maybe the RNG felt sorry for me; I won 9 of the first 11 hands. I spent all of 6 bucks on the thing, a far cry from my usual 20-30-40. 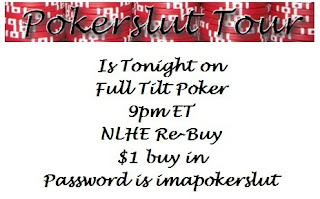 Which luckily leaves me donking funds in my Full Tilt account, as I've just received notice that the flavour of tonight's PokerSlut tour is a one dollah rebuy. I can't decide...all in first five hands as usuall? Or should I make it ten and some some singles as sacrifices to the poker gods? One Effer (FTF forum member) has put the over under on his rebuys at 28!